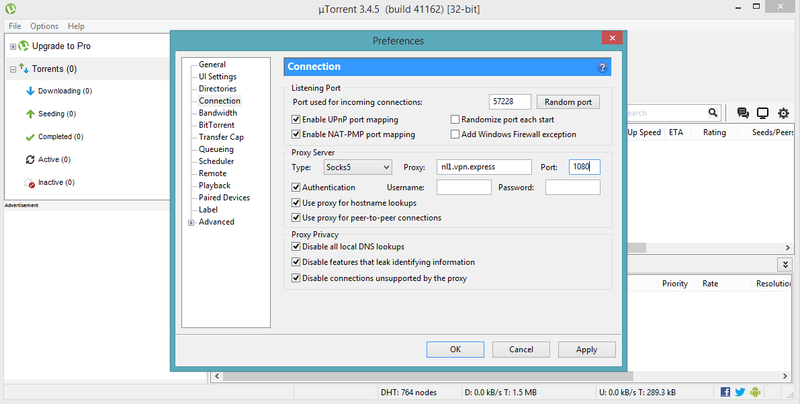 This is a tutorial to help you set up socks5 proxy on the microTorrent – uTorrent client. 1. Open your uTorrent client. 3. A new window pops up. Click on Connection. 4. On the Proxy Server section choose the Type Socks5. 5. For Proxy enter one of VPNexpress’s servers addresses, that allows torrent traffic. Here is a list of countries that allow torrenting – Romania, Russia, Sweden, Lithuania, Netherlands, Canada, South Africa. Therefore, you can freely choose one of the servers from those countries. The full server list with all server addresses can be found at: VPNExpress Server List. 6. For Port type 1080 and make sure you check the following boxes: Authentication, Use proxy for hostname lookups, Use proxy for peer-to-peer connections, Disable all local DNS lookups, Disable features that leak identifying information, Disable connections unstaticed by the proxy. Congratulations! You have just set up Socks5 for uTorrent. 3. A new window pops up. 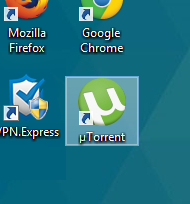 Choose the uTorrent program and press OK. Important: do not close ipmagnet website. 4. uTorrent will open automatically. Save the torrent file to your computer and click on OK.
6. While the file is connecting to peer return to the ipMagnet website. A new IP address, the one that you chose, appears. As you can see, it is the IP address of VPNexpress server which indicates uTorrent is downloading files through VPNexpress proxy thus ensuring your downloads to be hidden and secured.